The Sims are moving into a new neighborhood. EA announced today that The Sims 4 will arrive on PS4 and Xbox One on November 17, bringing the base game plus "many" post-launch updates to Sony and Microsoft's consoles. 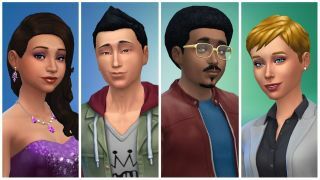 If you're somehow not familiar with The Sims by now (seriously, how is that even possible? ), your job in the game is simply to live whatever life you deem appropriate. Some players take joy in keeping things realistic and challenging their Sim to balance work and personal life, while others send their Sims on dates with vampires before settling down with a ghost and making vampire babies - but any style of player needs to make sure they don't burn the house down cooking mac and cheese. Those who pre-order the game will receive the Perfect Patio Stuff pack, featuring hot tubs and other outdoor decor. There's also The Sims 4 Deluxe Party Edition, which includes the Life of the Party, Up All Night, and Awesome Animal Hats content packs, as well as three days of early access. As the Sim version of me would say: gerb meshaloob nerbler!